Roberto Morandotti, Professor at INRS-EMT since 2008, has a broad knowledge in the field of photonics, ranging from the fabrication of integrated devices to the use of state-of-the-art optical characterization techniques in the Infrared and Terahertz frequency domains. During the last years, he has established a novel and very successful line of research in nonlinear optics and integrated photonics. Some of his most important realizations are related to the demonstration of discrete solitons in an array of optical waveguides, as well as, more recently, the realization of integrated classical and quantum frequency combs. In parallel he has established an exciting and successful research line related to Terahertz science and applications. Despite his relatively short academic career, he is considered a leading figure in his field, having published well over 170 articles in high impact factor journals. Furthermore he gave several invited and co-invited contributions at the major OSA, IEEE and SPIE conferences (about 120 to this date), as witnessed by an H-index of about 40 according to ISI Web of Science and a total citation number exceeding 6,500. The recognitions obtained during the last years testify the impact of his research on the scientific community. Among others, he has been awarded in 2011 a NSERC E.W.R. Steacie Memorial Fellowship (the most prestigious Canadian award for scientists at an early stage of their career. Furthermore, he is a recipient of the Royal Society of Canada Fellowship (one of the youngest in the Applied Physics Division). Today, he is Fellow of the Optical Society of America, SPIE, Institute of Nanotechnology, Institute of Physics (UK) and American Physical Society, Senior Member of the IEEE and full Member of Sigma Xi (i.e. the Scientific Research Society). He was the Program Chair and will be the General Chair of CLEO/QELS 2014 and 2016, respectively. Member, OSA (Optical Society of America). Member, IEEE (Institute of Electrical and Electronics Engineers). 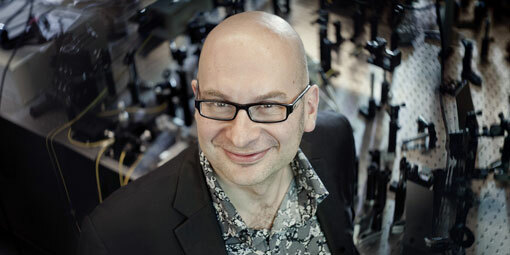 Member, CIPI (Canada Institute for Photonics Innovation). Member, COPL (Le Centre d’optique, photonique et laser). Fellow (2014) of the American Physical Society for “Pioneering contributions in discrete optics, nonlinear dynamics, and nonlinear optics in the THz domain”. Fellow (2014) of the Institute of Physics. Excellence Prize for Scholar Merit, Rotary Association, 1986 PhD fellowship, Bilateral UK – Israeli Fund, 1996–1998. Postdoctoral Fellowship, EPRSC (UK), 1999 Postdoctoral Fellowship, Weizmann Institute of Science, 2000-2001. Marie Curie European Community Fellowship, 2001·Postdoctoral Fellowship, University of Toronto, 2002. FQRNT (Fonds québécois de la recherche sur la nature et les technologies) Strategic Professor, 2003-3008. Associated Editor for the Journal “Advances in Nonlinear Optics”. Associated Editor for the Journal “Research Letters in Optics”. Editor of the Book: Proceedings of the SPIE Conference Photonic North, September 2005, Photonic Applications in Nonlinear Optics, Nanophotonics, and Microwave Photonics, edited by Roberto Morandotti, Harry E. Ruda, Jianping Yao, Proc. of SPIE Vol. 5971 (2005). Chair and Member of Program Committees and International Advisory Committees for a number of International Conferences and Workshops. Regular Visiting Professor at the Weizmann Institute of Science (Rehovot, Israel): 2003, 2004, 2005, 2006, 2008. OSA distinguished Lecturer (since 2006). Featured Press Release: « La Lumière Domptée » by A. Perrault-Labelle, Découvrir 26, 8 (2005). Featured in the 2004 and 2006 December Issue “Photonics of the Year” of Optics and Photonics News (OPN). In this special number the Editors discuss what are, in their opinion, the most promising among the recent breakthroughs in Optics.